SUKESADA (KOZUKE no DAIJO) The "Last Son" of BIZEN. 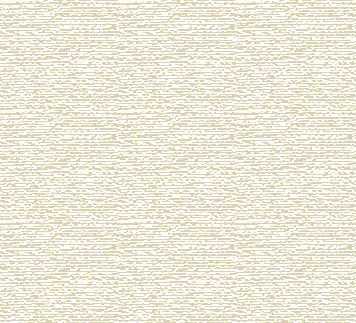 ___|____             KO-MOKUME MOKUME ITAME. Blue Steel. SUKESADA             SUGUHA, GUNOME-CHOJI MIDARE BA. KOZUKE DAIJO SUKESADA KAN-BUN(f: SHICHIBEI): YOKOYAMA HYOBEI. 11th day. Work from MANJI through SHOTOKU, 1688 TO 1711. Died: KYOHO ROKUNEN at 89 years. 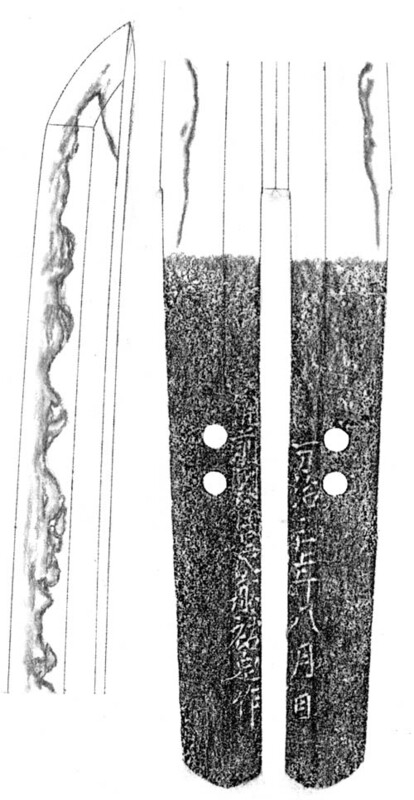 Chu-Suguha finds a high-rising Nokoha Saw-tooth in the Koshide. Tight Nioi and Ko-Nie. 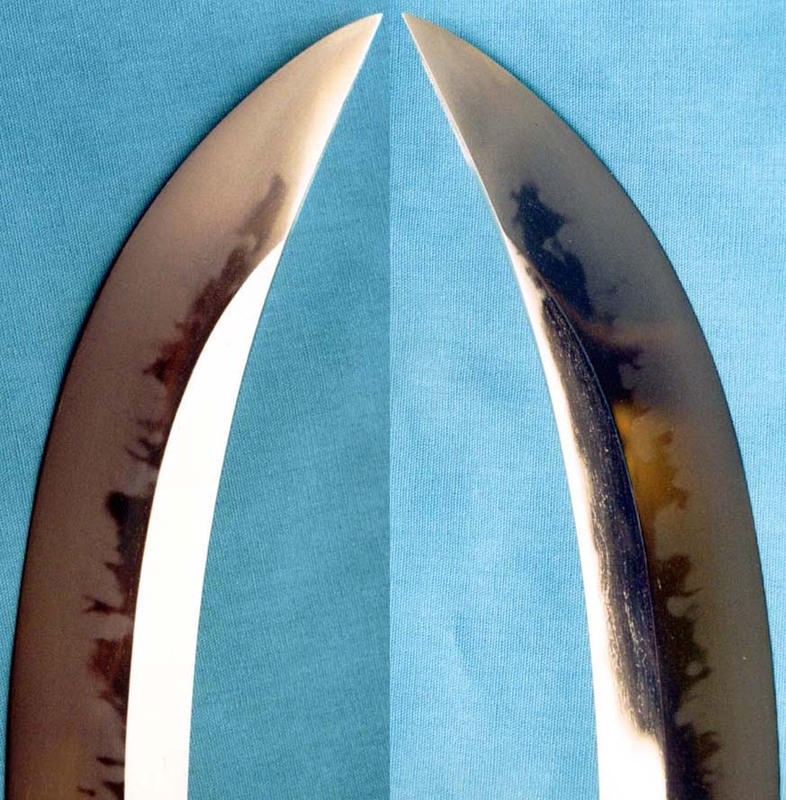 Hamon widens at the Boshi: Hiro-Sugu Saagari with Ko-Maru turn. Running and strong Mokume Hada with Ji-Nie. High-rising Fist and Crab, Kani-no-Tsume O-Choji-Midare Ba and Tobi-Yaki stretch fully across the wide Ji. In Nioi. 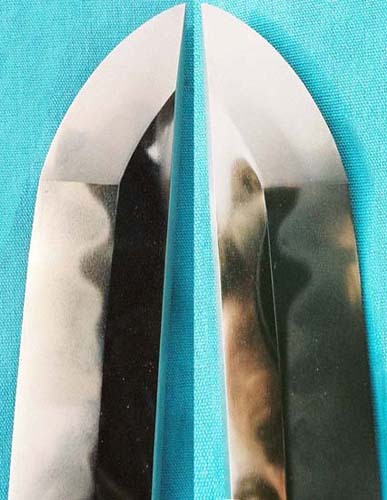 Midare-Komi Boshi with long Kaeri. 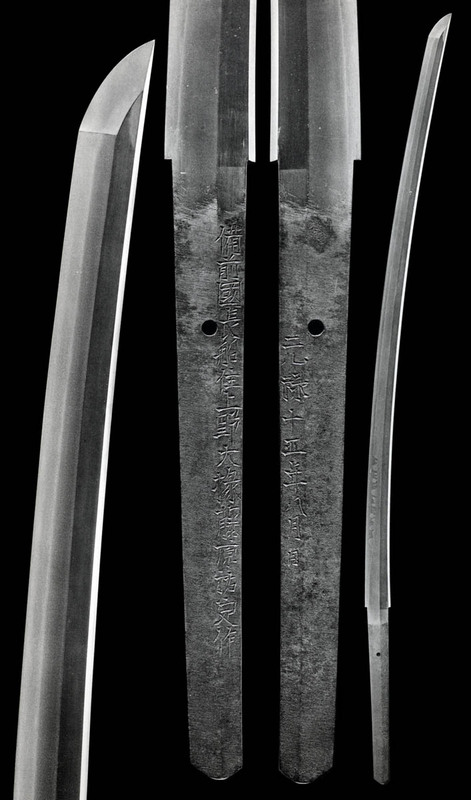 Ubu naginata Nakago with two Mekugi-ana. Hiro-Suguha of Gunome-Midare. hamon widens in the upper. Thick and healthy Shinogi-Ysukuei-Ihori-Mune with Chu-Kissaki. Running, tightly knit Itame Hada has Ji-Nie. Tobiyaki seat between an exuberantly high double O-Gunome Gourd pattern Hamon of profuse Nie and Sunagashi - which evenly reaches the Shinogi along the length. Billowing Koshi-Hiraki O-Gunome Midare Ba with Nie-swept Nijuba, Kinsuji and Sunagashi.